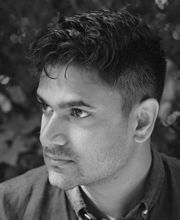 Naben Ruthnum’s 2017 book, Curry: Eating, Reading, and Race, identifies currybooks as those works in which the protagonist’s home country, frozen in memory and coloured by nostalgia, offers an alternative to feelings of displacement in the new country. But Naben, of Mauaritian descent, points out that the situation is more complex for second-generation people living in Canada. He identifies the specific “weirdness” of being a racialized person in a diaspora, seen as a tourist in your parents’ home country, yet not quite at home in the country of your birth. Naben won the Journey Prize for his short fiction, has been a National Post books columnist, and has written books and cultural criticism for the Globe and Mail and the Walrus. His crime fiction has appeared in Ellery Queen’s Mystery Magazine. Find out if your favourite author has been at the Festival!